The Montgomery Plaza in Ft Worth Texas is a historic building with a lot of character and history. 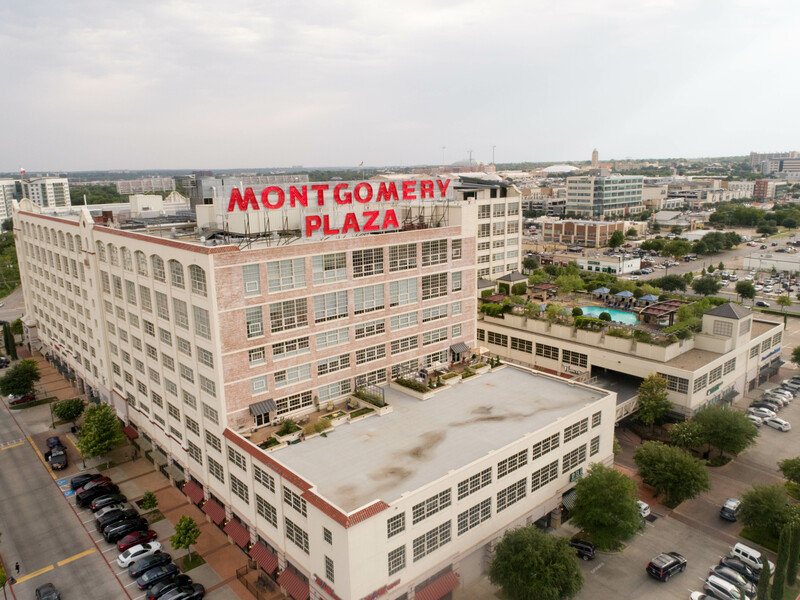 Located just west of downtown Fort Worth, TX, the building was originally constructed in 1928 as a regional retail and mail order warehouse for the retail company Montgomery Ward. 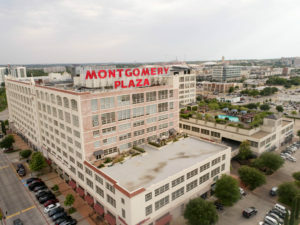 It wasn’t until around 2005 that the building was redeveloped and renamed the Montgomery Plaza where it now houses multiple larger department stores, many smaller retail stores and a luxury condominium. As a part of most renovation projects, a new roof had to be installed. They had a modified bitumen roof installed, considered one of the cadillac roof constructions for commercial properties. These roofs will typically last 20 plus years if constructed properly. The property owner recently won a lawsuit for improper construction and hired an engineering group out of the DFW area to help assess the roofs condition to determine what portions of the roof require repair or replacement. We were asked to come in to provide an aerial thermal roof scan on the lower portion of the building pictured above. The engineers suspected heavy moisture content due to improper installation of the planted areas on the roof. Curbs were not installed to prevent water from seeping through down into the roof system and our job was to confirm that and identify the extent of the damage. 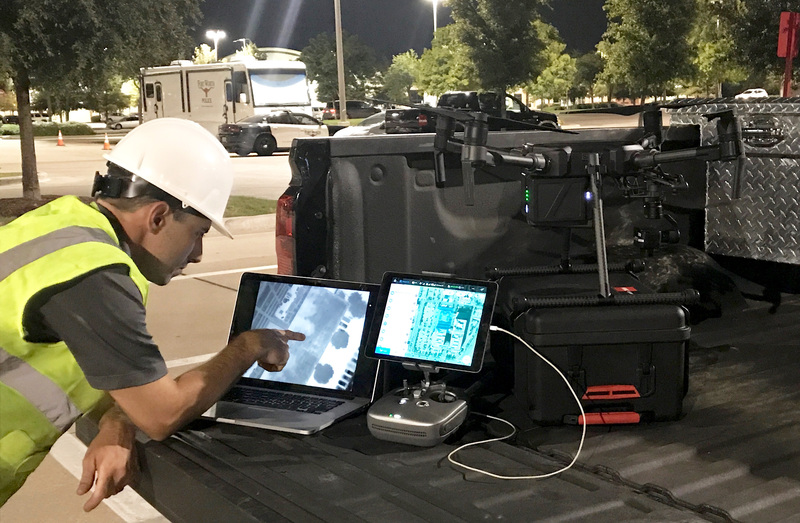 Before we fly at night, we capture visible or regular high resolution images of the property we are surveying or inspecting. Part of the reason for this is to perform a site survey, having a good understanding of obstacles we need to avoid, what elevations we need to fly to safely complete the project and capture the data necessary. We also need visible images to correlate with the thermal images we capture at night. Many thermal anomalies identified can be debris on the surface of the roof or other objects. We utilized the DJI Matrice 200 with an X4S camera, capturing 21MP visible images, and the Zenmuse XT thermal imager, capturing thermal images at 640×512 resolution. Using a drone allows us to efficiently and safely capture images from various elevations and angles of the same area to capture exactly what we need to understand a roofs condition. We captured oblique images as well as direct overhead images for processing. The direct overhead images are stitched and processed to help us calculate the square footage of the roof and estimate how much suspected moisture is present in the roof system. We then process everything into a detailed report, show casing exactly where we suspect moisture to be present. In our inspection process, we were able to identify roughly 4,643 sq’ of suspected moisture of the 8,196 sq’ we scanned. The thermal patterns do indicate the presence of suspected moisture does originate from the planted areas and has spread through the roof system based on the slope of the deck. The engineering firm will then follow up on this project performing a physical inspection to include core sampling the areas we suspect moisture to be present. Once the presence of moisture is confirmed, the condition of a roof is quite difficult to argue with. 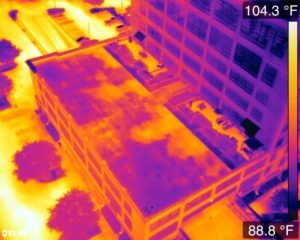 If this thermal roof scan process is performed in the early stages of the roof inspection process, it can save the engineers and other companies involved a lot of time and money as we can help you narrow down where to physically inspect the roof for damages rather than blindly look for problems. In this case, our reports helped the engineering firm understand where repair or replacement needed to take place, and formulate a cost analysis accordingly. The engineering firms job is not to actually perform the repair or replacement, but to advise, based on the detailed inspection process, what needs to be done and where to provide the client with a proper roof system that will last its life expectancy without giving tenants leaking problems.